Enrollment is quick and easy. Start your first course today! iPBU.org is an online edition of Patriot Bible University. Enrolled students may choose to study online with eCourses. How eCourses Work: The course workbook is delivered as an interactive pdf file that allows you to type your answers and email it back to PBU for grading. 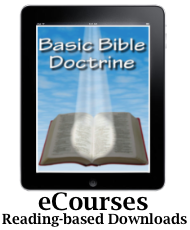 Our eCourse books are either a PDF document OR an eBook. The workbook is an interactive PDF document. All students are required to have a KJV Bible (Digital or Print). Patriot’s unique curriculum is reading-based, self-directed, and self-paced. Students do not sit through taped lectures, write pages of notes, and take multiple 'guess' tests. Rather, each Patriot course includes a 200-300 page textbook accompanied by a colorful workbook. The high quality workbooks ask the student questions directly from the reading assignment and the Bible. Read - Answer - Reinforce. Educating The 'Called' : Biblical Higher Education that is specially tailored for pastors, Christian school teachers and administrators, church staff, missionaries, evangelists, and all Christian workers who wish to continue their Biblical higher education. and the programs are flexible." We exist to educate the faithful remnant and those called by God into ministry. And there is no need to quit your job to attend. 2) Then, order and pay for your eCourses from the PBU eCourse catalog. 2) Order and pay for your eCourse from the PSB eCourse catalog. Start your first course today! Is America a Christian Nation? There is much discourse in the public square over this topic. What are the facts? A brief view of history that proves our American heritage is a Christian heritage. This course, based on extensive research, introduces the close relationship between God and American heritage.